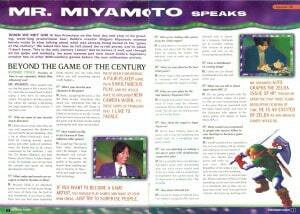 Many years ago, Nintendo Power sat down with Shigeru Miyamoto and asked him about Ocarina of Time and a few other games, including EarthBound 64. I forget the issue number, if anyone has it handy lemme know. How is EarthBound 64 coming along? Miyamoto: I think we can release EarthBound 64 by the end of the year. 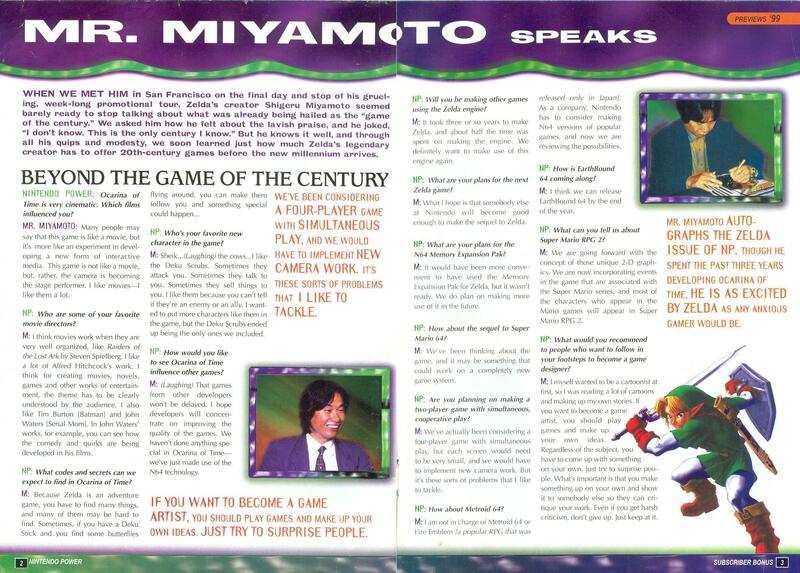 Shigeru Miyamoto is Director and General Manager of Nintendo EAD. He has his fingers in pretty much everything Nintendo does. i’m no fan of john waters, but really they couldn’t pick a better example of his work than “serial mom”? Super Mario RPG 2 AND Earthbound 64? Surely that would have been one great year. It’s not from a regular issue, but from a Subscriber Bonus pack-in leaflet. Judging from the “Preview ’99” header, I’d guess the one that came with the January 1999 issue, vol. 116. I don’t have it on hand, but I’m sure I can dig it out of a box if I look hard enough. I think Super Mario RPG 2 was Paper Mario. Just kidding. Reg is a nice guy. *smirk*. You’re correct, Will. It was. So, yeah, you cannot find this in any issue of Nintendo Power. This bonus booklet (that’s what it is, a mere booklet) is DAMN hard to find now, and since my dog shredded mine shortly after I scanned those… well, that’s one less floating around now. Noooooo, I just got my mind off EB64. That’s it, I’m going to put up my own custom poll! If you had a Phase Distorter and all the essential tools for space-time travel, what would you do with it? I know what I would do with it! We’d all go back and run down the streets of Japan surrounding the Nintendo HQ with EB64 chants, day and night, in the hopes of getting it released. If that doesn’t work, then we’d all barge into SpaceWorld ’99 and try to steal EB64. If that doesn’t work…. then we’d convince Nintendo (somehow) to make the N64 with a cartridge slot and a Disk Drive as part of the console! If that doesn’t work, we’d spread the word of EB64 to the whole world, convince as many people as possible to join us, then we’d make as many pre-orders of the game as we can with all of our combined money, anything to get EB64. If all else fails, we get elite ninjas to go to every Nintendo building in Japan to find the Mother 3 disk, and the Mother 3.5 disk! Maybe they want us to think it won’t be released, then they suddenly put the game up and we’re all surprised and happy… it’s just a thought…. uhmm….. Pro Tip: Never listen to Miyamoto or any other lead guy when it comes to release promises (I’M LOOKING AT YOU, ZELDA WII). Earthbound 64 for Virtual Console kudasai! I don’t think I really liked what I saw of EB 64 anyway, it doesn’t look like Earthbound, and if it were released, Mother 3 wouldn’t exist!